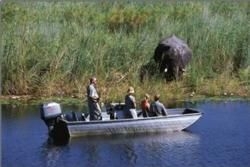 The mighty Okavango River has its origins deep in Angola where it is known as the Kubango River. It cuts deeply through the southern parts of Angola before turning south to snake through the northern parts of Namibia. The river ultimately drains into the celebrated Okavango Delta, a breathtaking expanse of swamps, wetlands and an incredible wealth of wildlife. The entire river system expands over 1,250km long making it the fourth largest in Southern Africa. The waters of the river are of great importance to the people living on its borders as well as replenishing the wetlands in Botswana. The environment is one of flourishing greenery and humble African structures. Huts line the roads and wood carvers sell their intricate wares to passersby. With Rundu as its capital, the region is one of the most densely populated in Namibia. The residents still live in humbleness and their traditional ways still form a major part of the area‘s ambience.